1. This product is not intended for non-smokers. Don’t use if you currently don’t smoke tobacco or vape. 2. Do not allow others to use your device at any time. 3. Keep all directions for future use and use only as instructed. 4. Electronic cigarettes, personal vaporizers, and e-liquids are not approved by the FDA. 5. This product is not a smoking cessation device nor is it intended to be one. If you are trying to quit smoking or vaping please consult your doctor. 6. You must be of legal smoking age in your jurisdiction to use this product. 7. Do not drink the e-liquid. 8. Expect to have variances of the ingredients and nicotine levels. Exact amounts are not guaranteed by volume or by way of aerosol. 9. Do not use while driving. 10. Vape outdoors and away from the vicinity of humans and pets. 11. Do not modify or attempt to disassemble this product. 12. Do not attempt to fix, correct, replace or install any part of the vaping apparatus, see your seller. 13. Do not use tanks and mechanical devices, mixing them may cause an explosion. 14. If you hear anything unusual from the device immediately stop using it and take it to your seller. 15. Dispose according to local laws. If a facility is unavailable return the used product to your seller. 16. Use this product in moderation, especially your first time. Failure to do so may cause nicotine overdose which can lead to an irregular heart beat and other symptoms. 17. Drink at least 8-cups of water daily. Nicotine is a vasoconstrictor and water aids your body to metabolize the nicotine. 18. Vape away from the vicinity of people and pets. The effects of second hand vapor have not been scientifically confirmed. 20. KEEP AWAY FROM CHILDREN, TEENS, AND PETS. 21. Do not use if you have existing health problems. 17. Do not carry or store batteries together with a metallic necklace, in your pockets, purse, or anywhere else where they may become exposed to metals. 18. Do not install tanks on mechanical mods, they will explode. 19. Keep away from children and pets. Should a child/pet swallow or chew on a battery, immediately consult a physician and or call your local Poison Control Center. 20. Always turn off your vaping apparatus in between uses. 21. Unplug the charging apparatus in between uses. 22. Please recycle or dispose according to local law. 23. Failure to follow warnings may result in electric shock, fire, burns, property damage, or bodily injury. Several types of goods are exempt from being returned. Perishable goods such as Liquid, cannot be returned. We also do not accept products that are intimate or sanitary goods, hazardous materials, or flammable liquids or gases. If you’ve done all of this and you still have not received your refund yet, please contact us at support@twistedmesses.com. We only replace items if they are defective or damaged. If you need to exchange it for the same item, send us an email at support@twistedmesses.com and send your item to: PO BOX 13443 Overland Park Kansas USA 66282. Orders placed before 6:00PM PST will be shipped next business day via USPS First Class or Priority Mail. Orders made after 6PM PST will be shipped on the following business day. Example: If a customer places an order on Thursday evening at 5:00PM PST, their order will be shipped Friday morning. If a customer places an order on Friday evening at 6:30PM PST, their order will be shipped Monday morning (the following business day). *During new product releases, holidays or store-wide sales, shipping delays may occur. Tracking numbers will be sent to purchaser’s registered email address. Once a package is passed onto the Postal Service it is no longer under the control of Twisted Messes LLC. If an order is lost by the Postal Service the buyer must contact us at support@twistedmesses.com to report the event. We apologize for the inconvenience but we are no longer able to process international payments directly through the website. For international orders please follow instructions at this link to submit your order manually. To return your product, you should mail your product to: PO BOX 13443 Overland Park Kansas USA 66282. Below is a complete statement of the Terms and Conditions of Sale which apply to your purchase and/or use of any and all products by TWISTED MESSES. Sale of any TWISTED MESSES’S product is expressly conditioned on your (the “Buyer” or “Buyer’s”) assent to these Terms and Conditions of Sale and TWISTED MESSES (the “Seller”) expressly objects to any additional or different terms. If you do not accept and agree to these Terms and Conditions of Sale, please return the product promptly. NO WARRANTY – THERE ARE NO WARRANTIES GIVEN BY SELLER WITH RESPECT TO THE PRODUCT, SPECIFCALLY, THERE ARE NO WARRANTIES, EXPRESS OR IMPLIED, ARISING BY OPERATION OF LAW OR OTHERWISE, REGARDING THE PRODUCT OR THE USE OF THE PRODUCT. Specifically, there is no warranty or offer of replacement or repair for any losses or damage due to misuse, accident, abuse, neglect, wear and tear, corrosion, moisture, Buyer’s or any other person’s negligence, unauthorized modification or alteration, use beyond capacity, use of unsuitable power sources or environmental conditions, improper installation, repair, handling, maintenance or application or any other cause not the fault of Seller. Unless otherwise specified by Seller in writing, Seller has no duty to inspect, observe, advise and/or warn as to the product, or as to any other products or conditions that might interact with or affect the product, at the time of sale, delivery, or otherwise. LIMITATION OF LIABILITY — SELLER IS NOT LIABLE FOR DAMAGES CAUSED BY THE PRODUCT OR THE USE OF THE PRODUCT AND IN NO EVENT, REGARDLESS OF THE FORM OF THE CLAIM OR CAUSE OF ACTION (WHETHER BASED IN LAW, EQUITY, CONTRACT, INFRINGEMENT, NEGLIGENCE, STRICT LIABILITY, OTHER TORT OR OTHERWISE), DOES SELLER’S LIABILITY TO BUYER AND/OR USERS FOR ANY OTHER DAMAGES HEREUNDER (INCLUDING, WITHOUT LIMITATION, DAMAGES IN AN ACTION FOR CONTRIBUTION OR INDEMNITY) EXCEED THE PRICE PAID BY BUYER FOR THE SPECIFIC PRODUCT PROVIDED BY SELLER GIVING RISE TO THE CLAIM OR CAUSE OF ACTION. BUYER AGREES THAT IN NO EVENT DOES SELLER’S LIABILITY TO BUYER AND/OR USERS EXTEND TO INCLUDE INCIDENTAL, CONSEQUENTIAL, SPECIAL, INDIRECT OR PUNITIVE DAMAGES. Unless otherwise specified by Seller in writing, it is expressly understood that any technical advice furnished by Seller with respect to the use of the product is given without charge, and Seller assumes no obligation or liability for the advice given or not given, or results obtained, all such advice being given and freely and voluntarily accepted at Buyer’s own risk. Buyer assumes responsibility for any loss, damage, or injury to himself/herself, other persons or property arising out of, connected with, or resulting from the use of the product, either alone or in combination with other products/components, and shall indemnify, defend, and hold Seller harmless for any such loss, damage or injury. DISCLAIMER OF RELIABILITY – THERE IS NO ASSURANCE OF MERCHANTABILITY OR FITNESS OF THE PRODUCT FOR ANY PARTICULAR PURPOSE. The product is for personal, recreational use and enjoyment only. The product is not a medical or smoking cessation device. Users should always rely on the advice of their physicians, and their own judgment, to make decisions concerning their health and wellness. 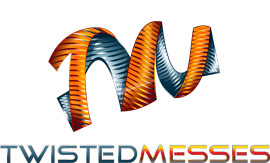 Email marketing (if applicable): We may send you emails about our store, new products and other updates, if you do not wish to receive email marketing or updates please contact us at support@twistedmesses.com or unsubscribe from the link provided in any marketing emails received from us. Got My RDA a week or so ago. LOVE IT. Get so many comments on it. Love this piece.